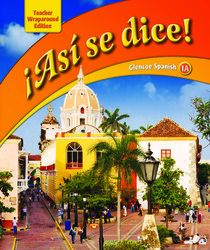 The Teachers Editions for Asi se dice! Levels 1A and 1B gives teachers the resources to help them plan and teach to a diverse student population. The Teachers Edition is a wrap-around edition which contains a copy of each page of the student edition with suggestions for pacing, introducing the theme, resources and other suggestions.